Flagship LS sedan begins its fifth generation. The all-new Lexus LS delivers a forceful presentation. When Lexus launched in 1990, the automaker brought to the market two sedans targeting America’s luxury makes — the full-size LS and the midsize ES. The LS served as the flagship model, bringing its own V8 power and rear-wheel drive to the segment, much in the same way as the Lincoln Town Car and the Cadillac DeVille had done. Meanwhile, the ES took aim at the big Buick, Oldsmobile and Mercury models of the day. Although it probably can’t take full credit with contributing to the end of the second and third brands, its presence in the market didn’t help. As the market turned, the big Lincoln and Cadillac models went away, giving Lexus a clear shot at the American consumer. But even the LS has to change with the times. This year, Lexus replaced the sedan’s V8 with a twin-turbo V6 engine. 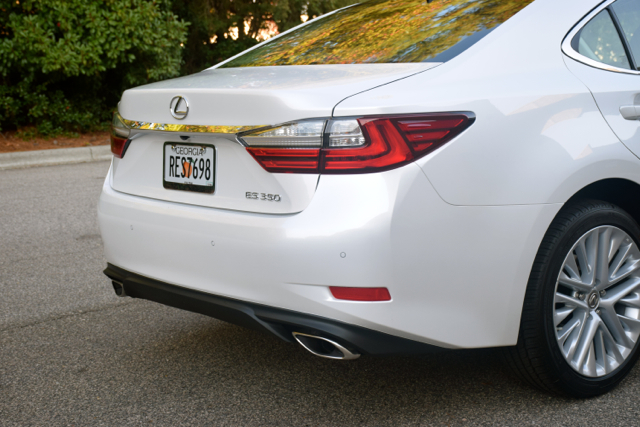 For 2018, the Lexus LS is an all-new sedan, launching the fifth generation of this venerable nameplate. For 2018, the big Lexus is officially known as the LS 500, replacing the previous LS 460. Until now, the numerical designation in the model name represented the engine size, as in 4.6 liters for the 460. Today, the 500 doesn’t correspond to the engine size, rather it signifies a more powerful, yet smaller engine. 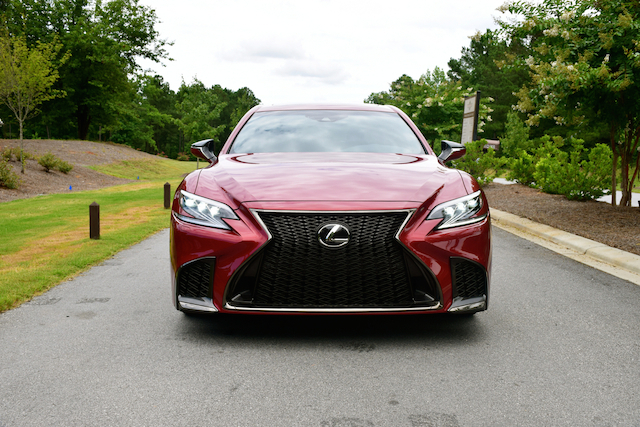 Lexus offers the 2018 LS 500 in four arrangements or two trims: LS 500 RWD ($76,025), LS 500 AWD ($79,245), LS 500 F Sport RWD ($82,085) and LS 500 F Sport AWD ($83,775). These prices include a $1,025 destination charge. 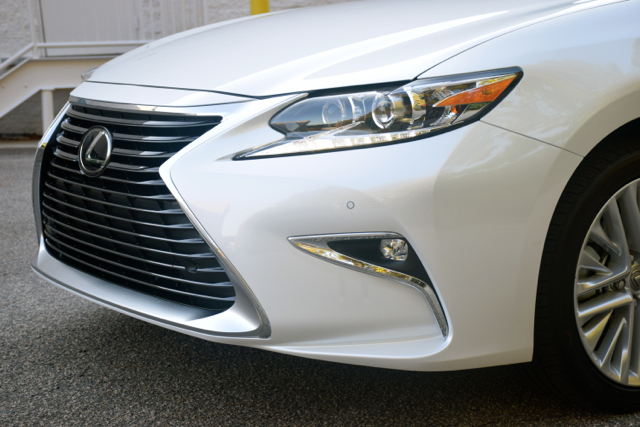 The difference between the two is that the F Sport offers certain embellishments, such as a mesh grille. The suspension system is specially tuned and works with large 20-inch wheels riding on run-flat tires. It is also a better steering and handling model, although it doesn’t rise to the enhanced performance level of Lexus’ “F” line. And lest you forget, Lexus is big on hybrids. This means the 500h is another choice, starting at $80,535 for rear-wheel drive and $83,755 for all-wheel drive. It comes with a naturally aspirated V6 engine, an electronically controlled variable transmission and electric motors. 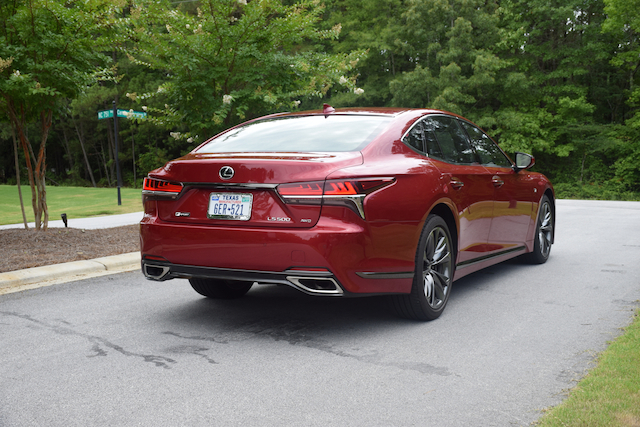 As for our review, this one covers the 2018 Lexus LS 500 F Sport, the model supplied to Auto Trends Magazine for a week of driving. In recent years, Lexus’ design language has taken on a more evocative (some say provocative) look, as the brand moves away from any semblance of blandness. The changes have raised the brand’s visibility in perhaps ways it could have never reached before. Loyalists may decry the new look, but then Lexus is also trying to reach a new breed of customer, including Audi, BMW and Mercedes-Benz owners. Front to back, the LS’ expressive lines are marked by an abundance of sculpting. The front fascia features the brand’s recognizable spindle (hourglass) grille flanked by zig-zag headlamps and honed in by deep embrasures housing the fog lamps. It follows with a long hood and an extended beltline that rises at the rear pillar. The raised rear deck sits short and wide, and offers its own expressive design featuring twin bisecting boomerang lights. Size matters and the LS certainly is big. The previous model had standard and stretched wheelbases on tap, but the new one has 123 inches between the wheels and is just over an inch longer overall. Among the standard items you’ll find LED headlamps with cornering lights, LED tail lamps and turn signals, power-folding and heated side mirrors with puddle lamps, a power moonroof, and 19-inch alloy wheels. The list of options include adaptive front lights and 20-inch wheels. The F Sport Package delivers its own look, including a special grille, a rear diffuser, a unique wheel design and large brake calipers. 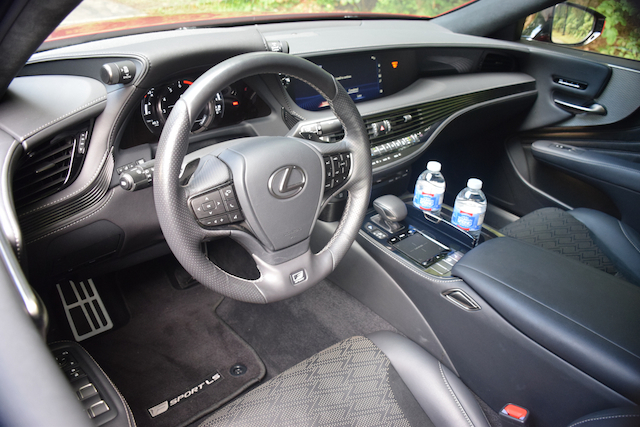 Sumptuous doesn’t accurately define the LS’ interior. Palatial, lavish and opulent are a few other adjectives that come to mind. Slip behind the wheel of the LS and immediately your senses are elevated. The look, feel, smell and sound are intensified. You can almost taste the luxury, although I don’t recommend licking anything. The cabin is quiet, even serene with strategically placed controls, quilted leather touchpoints, wood trim, and ambient lighting setting the mood. 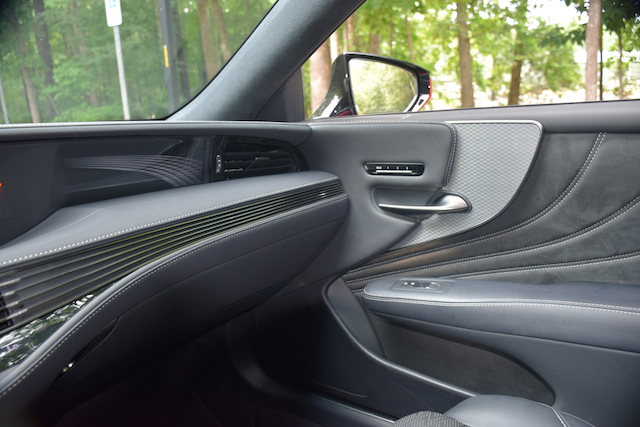 Even a section of etched glass is present, placed on the dashboard facing the front passengers. Is this merely eye-catching decor or does it hint at some future screen? Time will most certainly tell. 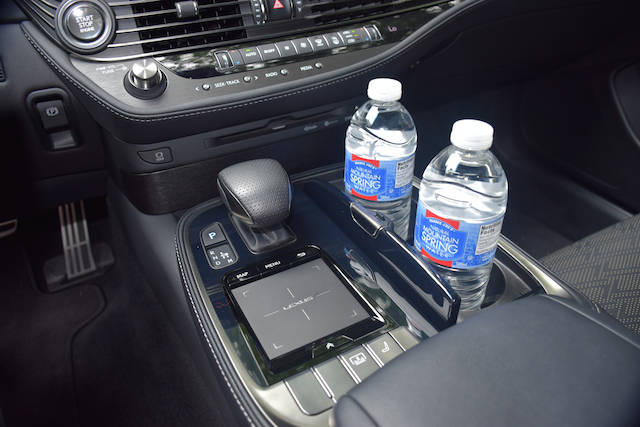 Five fit in full comfort in the Lexus LS with the available Executive Package making this a four-seat sedan. I don’t think I’ve ever seen an LS in livery service, but the capability is there. Consider it the ultimate executive car for the presidential suite, a fitting way to impress clients when family members aren’t the ones enjoying it. The list of standard features is lengthy and goes well beyond the expected full power accessories, leather interior, automatic climate control and power tilt-and-telescopic steering column. 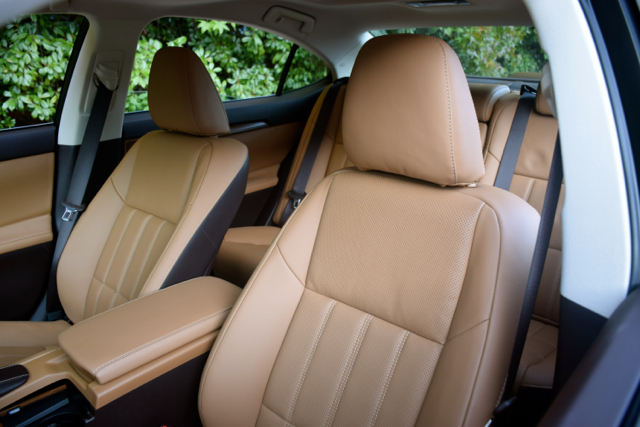 The steering wheel is wrapped in thick leather and heated, the front seats are heated and cooled, the driver’s seat is power operated and supplies lumbar support, even the front headrests are power controlled. All models come with a power rear sunshade. 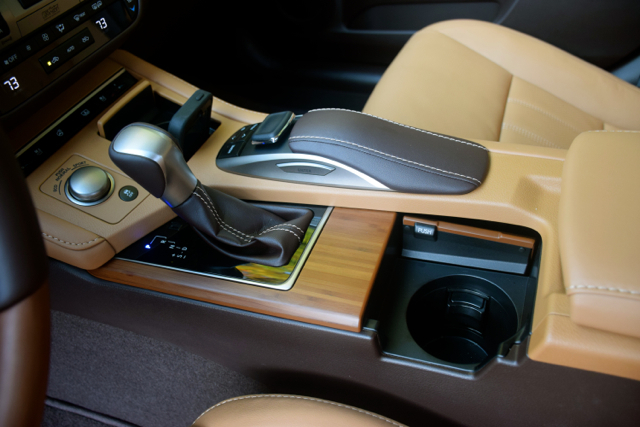 Upgrades include a leather-wrapped wood steering wheel, various wood trim choices, more exquisite leather, four-zone climate control, and power side-window sunshades. Additional upgrades are included in the Executive and Luxury packages. Lexus equips the 2018 LS with a 12-speaker audio system, Bluetooth connectivity and USB ports. A 12.3-inch color navigation display is also standard. Upgrades include a 23-speaker Mark Levinson audio system, which delivers concert-hall quality sound throughout the cabin. Standard safety technologies include Lexus Safety System, which represents a pre-collision system. This system includes pedestrian detection, all-speed dynamic radar cruise control, lane departure alert, lane keep assist and automatic high beam control. Other features include a now mandatory rearview camera, a blind spot monitor with rear cross-traffic alert, pre-collision braking and intuitive parking assist with automatic stop. There are two individual options available as well — a 24-inch heads-up display and a panoramic view monitor. 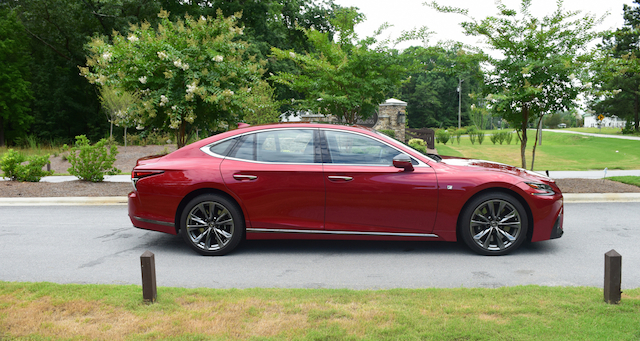 A 3.5-liter V6 engine powers the 2018 Lexus LS, but it isn’t what you might expect. This one is completely different from the 3.5-liter engine you find in other Toyota and Lexus products. Indeed, it measures 3444cc to the 3456cc of the traditional engine. Some sources (such as the EPA) call it a 3.4-liter engine, but we’ll use the sizing identification shared by Lexus. The new engine has an aluminum head and blocks along with a pair of turbos consolidated into the exhaust manifolds. With its unusually long stroke — 100.0 inches to 85.5 inches bore, Lexus claims the turbo achieves high levels of thermal efficiency. Importantly, it has an output of 416 horsepower and 442 pound-feet of torque. Lexus pairs this engine with a 10-speed automatic transmission. Fully loaded, the LS weighs about 5,000 pounds. The new engine, however, is up to the task of moving this large sedan. Step on the accelerator and the LS begins to move forward confidently. Floor the pedal and the turbos spool up after a momentary hesitation, rocketing this big sedan forward. The steering wheel is nicely weighted with small inputs moving this sedan with ease. Take the LS on twisty roads and it stays poised, hanging the lines quite well. On corners, the sedan leans ever so slightly. With all-wheel drive you can expect an extra measure of control as you pull out of corners or when navigating wet roads. At $75,000, this is a reasonable starting point for the 2018 LS. But most shoppers won’t stop there, with a significant number opting for all-wheel, the F Sport trim or both. Our model was so new that it didn’t come with a Monroney (sticker price and details), but we could deduce a few things and peg the price around $87,000 as equipped. 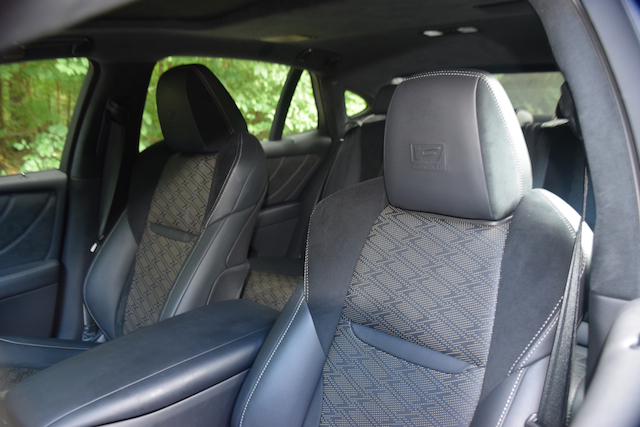 An Interior Upgrade Package ($3,730) kicks things off, adding a 28-way power driver’s seat with multi-function massage, semi-aniline perforated leather-trimmed seats, an ultra suede headliner and heated rear seats. Opting for this package required upgrading to the art wood organic, herringbone or laser special premium wood trims ($800). 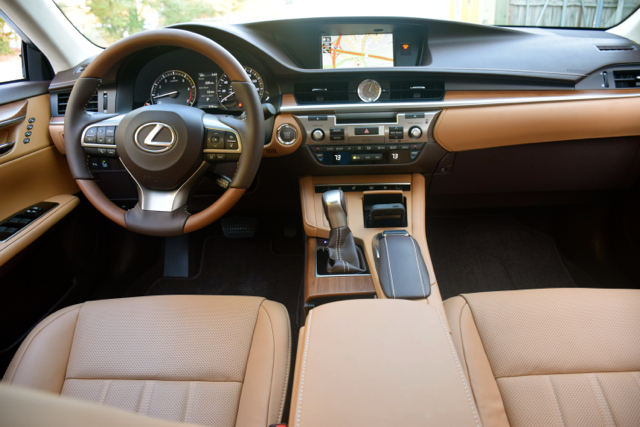 You also have to upgrade to the heated wood and leather steering wheel ($410), the 20-inch split-10-spoke wheels ($1,200) and choose one of four no extra charge interior colors. Choose the Lexus Safety System+ A Package ($3,000) and this brings in Lexus CoDrive with all-speed dynamic cruise control and lane trace assist, automatic emergency braking, a head-up display, intuitive pedestrian detection alert, front cross-traffic alert and road sign assist. Opt for this package and you must also choose an adaptive variable air suspension system with rapid height function ($1,500) and three additional options: a 24-inch heads-up display ($1,220), premium LED headlamps with adaptive front lighting ($300) and a panoramic view monitor ($800). There are three additional packages, which build on the base and subsequent packages, including a Luxury Package ($12,290), Executive Package ($17,100) and an Executive Package with Kiriko Glass ($23,100). Without going into full detail, these packages bring in such items as driver and front passenger massage, a right-rear power recliner, wood and leather trim, a rear center console touch-screen display and four-zone concierge climate control. A Cold Weather Package ($220) adds such items as a windshield wiper deicer, headlamp washer and an enhanced interior heater for faster heat output in cold weather. Individual options include a panorama glass roof ($1,000). Thus, the standard model with all-wheel drive can easily top $115,000. You can’t dress the F Sport as handsomely as the standard model with those prices maxing around $98,000, which was about $11,000 more than our test model. The 2018 LS is new, exciting and delivers a performance improvement over the previous model. 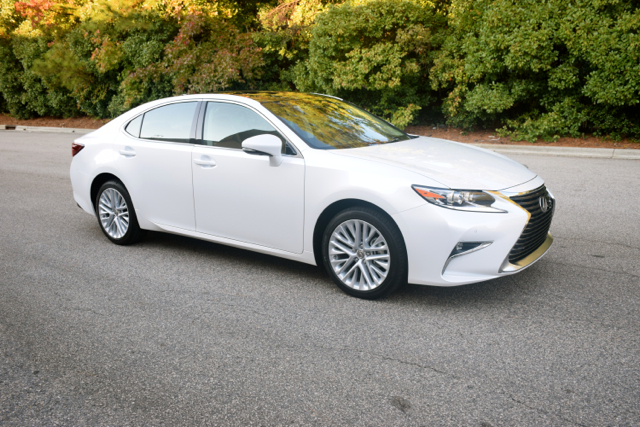 That Lexus remains committed to sedans demonstrates that this automaker intends to keep the segment fully covered. As the car pie shrinks, Lexus intends to have new models in place, in an effort to secure a larger piece of said pie. That strategy may work and could position Lexus to gain marketshare as competitors leave cars behind or if the market suddenly shifts away from crossovers and back to cars. 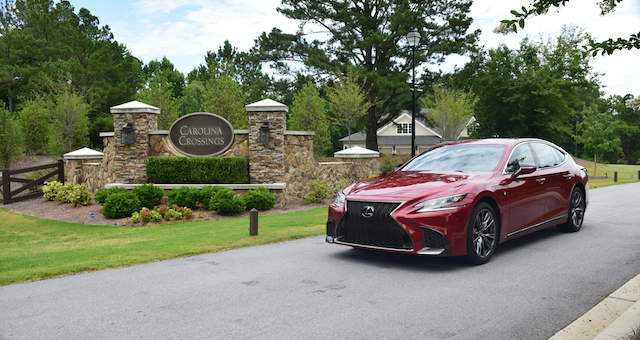 All in all, the 2018 Lexus LS has what shoppers in this segment want — a big, cushy sedan with the performance and luxury credentials to match. Lexus met the challenge and it shows.